Organizational Color, The Corps of Engineers. 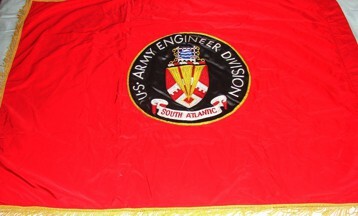 The Corps of Engineers is classed as a "whole-branch" regiment (rather like the British Royal Artillery) and as such it has its own organizational color. The separate TOE battalions of the Corps have similar colors, with their own shields, crests, mottos and designations. The Corps' one-word motto, ESSAYONS, is repeated on both sides of the motto scroll. Red and white are the Corps of Engineers branch colors. 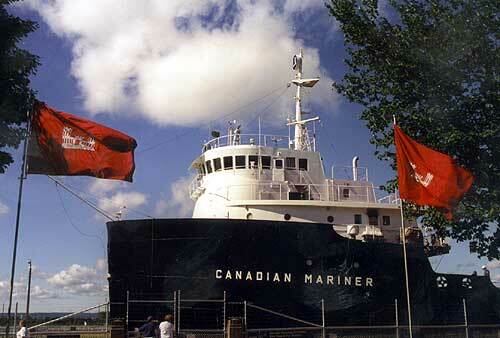 Vessel Flag, Corps of Engineers. This flag is also authorized to be flown on land by Corps of Engineers facilities that are not located on Army installations. It dates from the early part of this century. Originally intended for vessels it is now used by divisions, districts, laboratories, offices and facilities of that corps. See AR 840-10 Chapter 7-7 for full details. Although the US Army site doesn't mention it, the image of the castle is said to be (at least by a local paper here in Queens) to be based on a building (now the officers' club or something like that, but originally the main building) at Fort Totten, Queens, New York City. While it doesn't look exactly like the castle on the flag, the resemblance is striking (or maybe either a lot of forts looked like that, or perhaps the building was based on the flag). Regarding the castle insignia displayed on the flag, here's the origin: "The Corps of Engineers branch insignia, the Corps Castle, is believed to have originated on an informal basis. In 1841, cadets at West Point wore insignia of this type. In 1902, the Castle was formally adopted by the Corps of Engineers as branch insignia. The castle itself is actually the Pershing Barracks at USMA in West Point, NY"
The castle symbol is also used by combat engineers in the Marine Corps. The Corps do not have a flag just for them, but allows the symbol to be put on plaques, graves, and other items of Marine combat engineers. 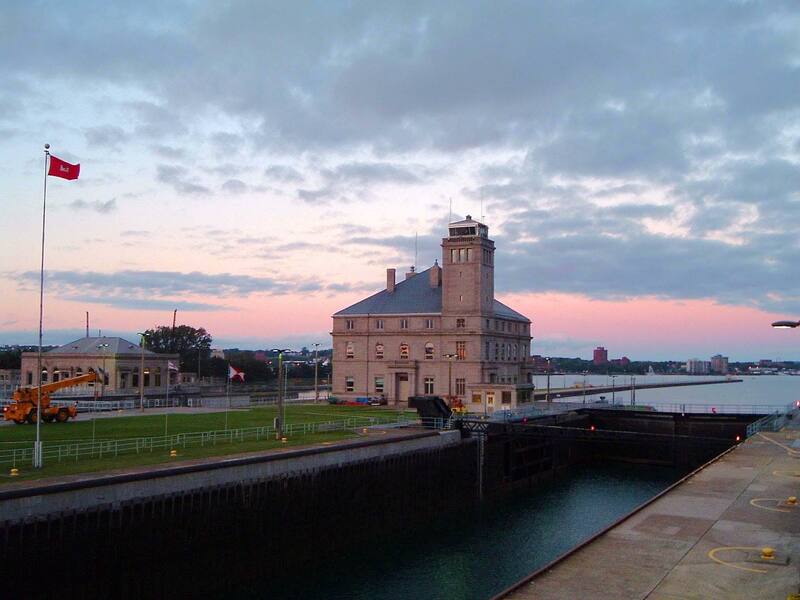 "Further to the northwest are the Soo locks at Sault Ste. Marie, Michigan, which provide a vital connection between the upper Great Lakes and Lake Superior. Access to Lake Superior and the Canadian lakehead at Thunder Bay, Ontario and the U.S. lakehead at Duluth, Minnesota is gained via the locks on the St. Mary's canal, which are administered by the U.S. Army Corps of Engineers. The two locks currently operational for commercial navigation purposes are the Poe and the MacArthur." (As the) "funds required exceeded the state's capabilities (...) in 1881 the locks were transferred to the United States government, and were placed under the jurisdiction of the U.S. Army Corps of Engineers. The Corps has operated the locks, toll free, since that time." So the red flag with the white castle flies there, very appropriately: image16.webshots.com/17/7/81/62/195678162jfvnYb_fs.jpg. The castle is rather small, perhaps this is a requirement for corps flags used on land? Judging from the photograph at http://www.boatnerd.com/pictures/fleet/thumb/can-mariner-corps-flag-jpg.jpg , one can conclude that the castle insignia is much smaller than shown above. Engineer Regulation 840-1-1 provides that a division or district engineer may authorize the flying of a pennant to denote his or her presence aboard a vessel. Only one such pennant may be flown at a time; if the division and district engineers are both aboard the same vessel, only the division engineer's pennant is displayed. The pennants are 29 x 45 inches. If a general officer of the Army is aboard, his flag is flown instead of the division or district engineer's pennant. Division Engineer pennant: vertical stripes of red (9 inches wide), white (15 inches wide), and blue, with a red Engineer castle measuring 7.37 x 12 inches centered on the white. The colors are specified as Old Glory red (Cable #70180 on the Standard Color Card of America) and National Flag blue (Cable #70077). District Engineer pennant: white with the Engineer castle in red, its centerline located 14.5 inches from the hoist. The Corps of Engineers� South Atlantic Division is one of eight regional offices of the Corps overseeing military and water-resources design, construction, and operation in the eight states in the Southeast, the Caribbean, and Central and South America. The division has five districts located in Wilmington, N.C.; Charleston, S.C.; Savannah, Ga.; Jacksonville, Fla.; and Mobile, Ala. The South Atlantic Division designs and builds major military facilities for the Army and Air Force in the Southeast. Serving 11 major Army posts and 13 Air Force bases, the division builds barracks, hospitals, office buildings, commissaries, and other facilities to meet the needs of the American military. Within the division boundaries, 32 percent of the stateside Army and 18 percent of the Air Force find their home, and four major commands have their headquarters. The Mobile and Savannah Districts handle military programs for the division. Thirty-three multiple-purpose projects in the Southeast provide citizens with flood control, hydroelectric power, water supply, recreation, navigation, and wildlife enhancement. The South Atlantic Division operates and maintains more than 6,000 miles of federal navigable channel and 29 major harbors in the region. The division also has a growing environmental-restoration workload, including the largest single environmental-restoration project in the world, the Everglades Restoration in South Florida. The U.S. Army Corps of Engineers works in concert with the private sector in accomplishing its military and water- resources programs. By contracting with architect-engineer, construction, and many other types of companies, the South Atlantic Division designs, builds, and operates dams, waterways, buildings, recreational, and other facilities throughout the region.